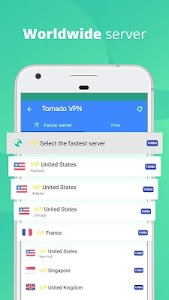 Tornado VPN, total free VPN client. 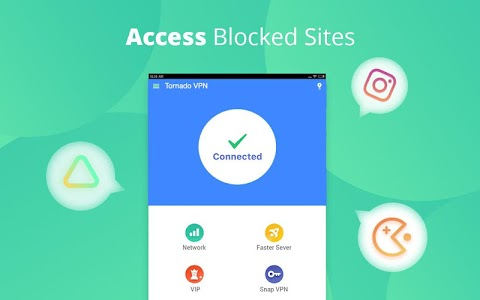 Tornado VPN – Free VPN proxy, connect as a hare to unblock sites, WiFi hotspot secure and protect privacy. No need an account, just one click to connect. 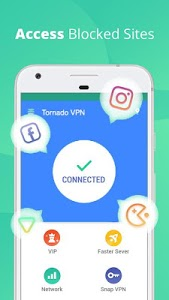 Tornado VPN doesn’t track or keep any logs of its users and their activities. All data are and safe, personal privacy is ensured. 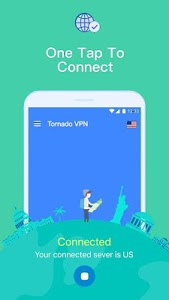 You are completely private with Tornado VPN. 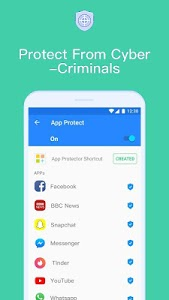 * Screenshots and description may differ from app. Also, the app may not work well for a specific country and everyone at anytime! * Please Note: Connections are shared with all users. So, you may experience a drop in speed. * Please Note: All servers and locations may not work and may not be available. 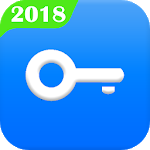 Similar to "Tornado VPN – Free VPN & Fast Secure VPN"